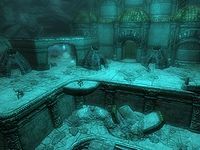 Irkngthand is a large Dwemer ruin located far to the west of Windhelm and south of Lake Yorgrim. There are four zones to the ruin, the Irkngthand Arcanex, the Irkngthand Grand Cavern, the Irkngthand Slave Pens, and the Irkngthand Sanctuary. Irkngthand contains a large statue, which depicts a Snow Elf before the race mutated into the Falmer. Irkngthand is located in a secluded and difficult-to-reach area of Skyrim. The entrance can be reached via a dirt path from Nightgate Inn in the Pale. The path diverges and also runs to Tumble Arch Pass, so take the eastern path when it splits. In the courtyard of the ruin there are a number of bandits and chests to loot. Entrance to the interior is impossible until you have started the Thieves Guild quest Blindsighted. The door can be reached by coming down the mountain from the other side, and climbing along a series of wood bridges; but it is key-locked and thus inaccessible. As you pass through the entrance a bandit will stand up from a seat hidden just behind the bushes in front of you, and warn you to not approach any closer. If you force hostilities, the bandits further into the ruins will be alerted to your presence. Be careful if trying to stealthily kill the bandit, as there are another two bandits patrolling the ruins to the west who may spot you. Also hidden by the bush, along with the chair, is a cooking spit, two bedrolls, and a barrel with bottles of Nord mead in a pot over the fire and two baked potatoes on the ground beside it. Progress is blocked by raised metal spikes, forcing you to go past the two patrolling bandits to bypass the gate. Under the fallen structure to the south is a table with an adept-locked chest, a coin purse, a leveled potion of healing, a potion of minor healing, and a potion of minor stamina. The path narrows after doubling back on itself, and has a few traps. There is a bear trap against the wall to the right, another to the left of the path, and a final one to the right of the path, just before the stairs. At the top of the stairs to the right is a bandit, usually sitting in a chair overlooking the entrance, but sometimes patrolling to the top of the stairs from the chair. To the left of the stairs is a bedroll with a random healing potion and a random potion of magicka next to it. Past the bedroll, there is an alcove to the right with two bandits, two bedrolls, two barrels, an unlocked chest, and a leveled potion of stamina on the table above the chest. There is a tower in the middle of the area from which it is possible to jump along the ruins and skip the next booby-trapped tunnel. The tunnel, lit by a torch, is fairly short, but beware of the Dwarven pressure plate. The plate, located in the center of the tunnel, activates a few spears from the wall on the right. There is a bandit patrolling the area after the tunnel, where the lever to lower the spikes at the entrance is located. Located on the other side of this bandit are the wooden stairs which ascend the cliff face and take you to the top of the ruins. Across the top of the ruins, linked by wooden platforms, is a bandit standing in a corner. Around the path is the bandit chief, sitting on a bench and looking along the path. Beside the bench is an unlocked chest, and an adept-locked Dwarven wall chest. This is as far as you can go without having started the quest Blindsighted. It is possible to reach the door to the Arcanex by climbing and descending the mountain behind the ruin, but the door is key-locked at this point. If the Blindsighted quest has begun there will be a double set of wooden stairs leading up to the Arcanex from the bandit chief's perch, and the door will be unlocked. Inside the ruin there is a brazier lighting up the entrance, ruining all chances of a sneaky entry. Luckily, further inspection shows that the bandits in the next room are all dead. On both sides in the entrance is a bench and two tables. Straight ahead is another table, past which is a bandit camp with five bandits, all of whom are dead. The first three dead bandits are lying beside bedrolls, the fourth is on the first set of stairs after the fire, and the last is at the top of the same stairs. There are two bear traps just after the fifth bandit. By the bedroll to the right as you first come down the stairs is a random healing potion, and to the left, behind the campfire, is an expert-locked chest. If you return to the second highest level and follow it east and south, past four stone benches, you will find an adept-locked Dwarven chest hidden in the rubble. From the last dead bandit past the camp, walk west and north, staying on the same level, and past another four stone benches. There is a master-locked Dwarven chest hidden around the corner. Just before the exit, located to the southwest, is a Dwarven scuttle, containing a leveled Dwarven sphere. There is also a broken Dwarven sphere just past the scuttle. Through the corridor are more remnants of battle; two Dwarven spiders and a sphere. There is a scuttle on either side of the room, though only the far one contains a sphere. If you turn right after the next gate and follow the ledge to the end, you will find an unlocked Dwarven chest. Be careful, as you must pass another two scuttles with spheres, one in the wall to the right, and one on the level below. At the bottom of the stairs is another sphere, waiting in the open and against the south wall another unlocked Dwarven chest. "This place, it's like a maze. How did the dwarves find their way around?" The next room contains a series of six rotating flamethrower pillars, each with four nozzles. The first two can be evaded by sticking to the walls, while the next three can be evaded by climbing over the rubble, while the last is not evadable because it covers the gate you need to go through to explore the deeper sections of the ruin. Take care while passing the pillars as up to five leveled Dwarven spiders may emerge from scuttles in the walls. Before the stairs around the corner is an apprentice-locked Dwarven chest. The next walkway extends beyond the lift to the right, and the master-locked gate to the left, to a Dwarven spider working on some rubble, among which is an unlocked Dwarven chest. Just to the right of the lift, in the corridor, is an alchemy lab, and strewn across the table are two flasks of Dwarven oil, a chaurus egg, two Falmer ears, and two potions; one a leveled potion of strength and a random potion of healing, magicka or stamina. Continuing north past the gate, the corridor will end in rubble. There is a Dwarven chest hidden in the rubble with a Dwarven spider guarding it. The locked gate opens above the rubble by the fourth flamethrower pillar, and the lift leads to the Grand Cavern. Brynjolf and Karliah are waiting at the bottom of the stairs after the lift. You are forced into conversation with Karliah. After which you can start the chase through the doors which are trapped in the bottom left-hand corner. Opening them without first disarming it will trigger a swinging mace—the first of many traps set by Mercer Frey to hold you up, and perhaps kill you. There are two broken Dwarven spiders lying on the floor, and on the stone table in the right-hand corner are three lockpicks and a bottle of Black-Briar Reserve. Along the corridor is another broken spider, and behind an expert-locked gate in the left-hand wall, a leveled potion of healing, a potion of strength, an amethyst, a sapphire, a gold ingot, a silver ingot, a Dwarven metal ingot, and an unlocked chest. In the next room, if you move to the grates and look south, you can observe Mercer stealthily killing two Falmer. Before the closed doors there is a bleeding crown fungus growing in the unlit lantern holder. Through the closed doors and down the slope are some chaurus egg sacs. Upon entering there is a leveled Falmer patrolling from a Falmer tent on your right down to the bottom of connecting stairs and back again. To progress you need to find two levers and activate them, then make your way through the Falmer camp. The first lever is to the left, over the rubble. Sticking to the higher walkway, there is an unlocked Falmer chest around the corner from where you entered. Inside the first tent are five poisons, including three bottles of frostbite venom. There is a broken Dwarven door to the right as you make your way across, and an empty Falmer tent on the opposite side. To the northwest of the empty tent is an expert-locked gate, behind which is a Dwemer ballista, aimed at a leveled Falmer below to the west; it is activated by a lever just below it. On the other side of the locked room is the second lever and an unlocked Dwarven chest. Both levers must be activated within a short time of each other, and can be checked by looking at the cogs on either side of the raised bars below. At the bottom of the connecting stairs down is a dead Falmer. 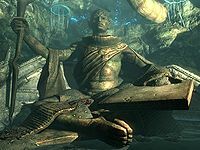 There is also a broken Dwemer sphere in the rubble to the west, and to the north, behind a stone bench, is a novice-locked Dwarven chest. There are two hidden spinning blades on the stone path leading to the Falmer camp, marked by stone outcroppings in the ground. The Falmer that the ballista pointed at is to the left, and another one is to the right, above the 'farm'. Two Dwemer spheres can be activated in this area, which the Falmer may accidentally do before you get there. The two scuttles are on either side of the top level in the farm section. There is also a Falmer pen containing two skeevers beside the tunnel to the next area. In the 'farm' area there numerous harvestable fungal growths: five bleeding crown, four blisterwort, two fly amanita, two imp stool, four Namira's rot, and three white cap fungi. Also on the top level is an adept-locked Dwarven chest, hidden in the rubble to the right from the stairs. Behind the lower level tent on the right-hand side is an imp stool, another imp stool just before the tent on the higher level, and a blisterwort behind it. There are two blisterwort lower down on the same side. There is a tanning rack by the higher tent, and on the table opposite, a sample of fly amanita, a glowing mushroom, two pieces of chaurus chitin, a sample of Namira's rot, and a skeever tail. "Keep as quiet as you can. The Falmer may be blind, but they can still hear us." There is a bear trap around the corner in the tunnel to the next open section. There are two paths here, the higher and the lower paths. The high path starts to the left with a short ramp up. 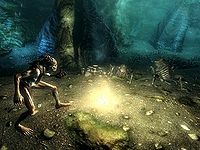 As you turn around, a leveled Falmer will walk from behind the rubble behind the fallen Dwemer structure, and crouch down. If you follow the Dwemer-made ramp up and above the entrance to this chamber, you will find a table with some ingredients on it. There is a piece of chaurus chitin, a Falmer ear, two glowing mushrooms, a sample of fly amanita, a skeever tail, and a sample of bleeding crown fungus on the table. From up here you should be able to see the three leveled Falmer guarding the path across the chamber. Looking west there is one Falmer walking on the ground above the lower path, another Falmer above the Dwemer structure to the left, and another two on the Dwemer structure in the distance to the right. The two high-up leveled Falmer are difficult to reach, but they will both drop down to the ground if they detect you, but are unable to target you. If you wish to avoid most of the Falmer then take the lower path. It starts under an improvised bridge patrolled by a Falmer. Follow the winding path, and when it opens out again, climb the rubble to the left which should bring you to a tent. Go around it to the right and loot the Falmer chest hidden there, then drop back down to the lower path. Otherwise you can start by killing the Falmer behind the first structure and proceeding to the chest, then double-back to the Dwemer ramp to take care of the rest. From the Dwemer ramp drop down and then climb the rubble around the front of the first fallen structure. There is one Falmer here, patrolling across an improvised bridge to a tent. There is nothing inside the tent, but growing around it are two bleeding crown, a fly amanita, and two white cap fungi. The first time you pass the fallen Dwemer structure to the left, the whole chamber will shake. The reason for this is soon apparent; a Dwemer tower at the far end of the chamber has just fallen down. Obviously you will need to find another way forward, but first descend the steps to find an adept-locked Dwarven chest in the middle of the rubble. To the left of the stairs is a Dwemer ramp. There are two leveled Falmer patrolling here: one patrols the first ramp, while the second patrols the first flat section. The second Falmer who is a magic-user, carries a shaman's key, which unlocks some locked Falmer locations. "Mercer's been here, I hope we aren't too late." Through the door at the end of the ramps is a tunnel. There is a bear trap just at the start, and in an alcove to the right. In the alcove, there is a bleeding crown and a Namira's rot fungi. There are a further two bear traps down the stairs, one on each level, and easily visible against the lightly colored ground. There is a dead Falmer in the room at the bottom of the stairs. It is lying beside an improvised campfire, over which is a charred skeever, with a few ruined, and burned books. There is also a few loose coins near the body, and by the closed gate in the southeastern corner. On the table in the room are two more charred skeever hides and four ruined books. 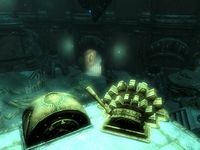 There are several sets of metal shelves by the table holding various smeltable Dwemer metalwork and hidden on the other side of the table are a scroll of detect life and a leveled potion of healing. Around this room there are four wall braziers; in total there are three bleeding crown and a fly amanita fungi growing in them. There is a storeroom to the northwest containing three empty Dwarven chests, more smeltable Dwemer metal on shelves and a burning torch. There are, however, two scrolls of detect life, one on the left-hand shelf, and the other to the right behind the gate. There is an "Empty" shadowmark on the empty chest in the middle, and on the wall above is a message written by Mercer Frey. The message reads: One Step Ahead -Mercer, and it is laterally inverted (a mirror image). Through the gate there are two more bear traps, so avoid them before entering the next cavern. You can see that the path passes far overhead, but there is a Falmer camp to avoid or destroy first. 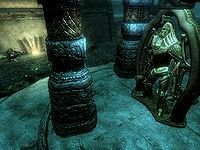 There is a broken Dwemer sphere on the path in front of you, and at the bottom of the stairs is a Dwarven centurion (see bugs) in a charging gantry. It will activate upon your approach but not for the Falmer, even though they pass closer to it. There is a button to activate the centurion to the right and on the ground, you can activate it to help thin the number of Falmer in the area. If Dawnguard is installed there are a couple of chaurus cocconsDG by the stream. To safely avoid all the Falmer in this area you must first drop down to the ground on the right after the entrance, then follow the stream that contains three salmon, until it turns east. Don't turn the centurion on as this will result in the winner actively seeking you out. When it turns east, move to the stairs to the south and ascend them. Follow the path to the east, keeping to the walls to avoid the skeevers in the pen detecting you. 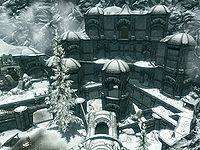 Wait in the southeastern corner until the patrolling Falmer is on the ground level, then proceed upwards. Those wishing to clear out the area can start with dropping down and activating the centurion. 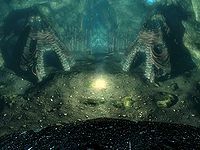 There are a total of five leveled Falmer in the area, two in the camp, one patrolling the river, one on the other side of the camp and one patrolling the path beyond and above that. In addition, there are two skeevers in a pen to the southeast, between the last two Falmer. Two of the tents in the camp contain hay piles, and there is harvestable salmon to the north. To the south, across the stream, are six chaurus egg sacs in front of another farm. Growing in the farm are four Namira's rot, three blisterwort, an imp stool, two white cap, a fly amanita, and one bleeding crown fungi. On the other side of the path is a bleeding crown fungus, and another is at the bottom of the stairs, on the other side to the skeever pen. Ascend the stairs, but be careful on the second set to the left, there is a tripwire on the top step which activates a claw trap hidden behind the pillar to the left. The tripwire can be avoided by staying to the right of the stairs. Over to the left is the next set of stairs, with a dead Falmer lying at the bottom, and a fly amanita fungus to the right. Follow the stairs up, then take the bridge across the cavern, looting another dead Falmer in the process. Just before you leave the bridge, look to the south and observe the frostbite spiders in a room filled with cobwebs. In the short corridor there are three bear traps. The first is in the middle, the second to the left after that, and the third has apparently killed a Falmer, who is lying on top of it. As you exit the corridor stop again. Two leveled Falmer should appear and start patrolling across the flat section. You can observe their paths and sneak past if you wish. To the right of the right-hand tent is an unlocked Falmer chest and a skeleton that can be looted. Between the left-hand tent and the door to the Slave Pens is an unlocked high-leveled Dwarven wall chest. Opposite the door there are the two Falmer killed by Mercer: one on an outcropping and another to the right and further away. There are three frostbite spiders in the spider room and one spider egg sac. The section is filled with a misty fog, and is in a rather more decrepit state than the previous sections. After the first room you will find a Dwemer spider by the stairs in front of you. The stairs lead to an apprentice-locked gate. The only things of interest behind the gate are a silver ingot, an orichalcum ingot and several pieces of smeltable Dwemer metal. Directly south of the stairs there is a single glowing mushroom growing on the wall, and a further three growing to the east of that. Underneath the three mushrooms is a broken Dwemer sphere and to the left of this is an unlocked Dwarven chest. "Even the Falmer don't deserve the pain these implements must have inflicted." East of the stairs are more stairs; descend them, but watch out for the bone chimes at the top of them. If you make it to the lever undetected you can use it to activate a spinning blade trap, which may kill or injure the two leveled Falmer in the torture room on the level below. You can even watch the deed through the grated fence. Don't forget to turn it off before entering the torture chamber. There is a dead thief on one of the racks in the room, who carries a note about a captivating discovery. On the table there are three salt piles, a Dwarven dagger and sword, a weak poison, three bottles of frostbite venom, a weak lingering poison, lingering stamina poison, two weak aversion to fire poisons, a potion of minor healing, and a leather strip. To the right of the table, hidden in the darkness, is an unlocked Dwarven chest. 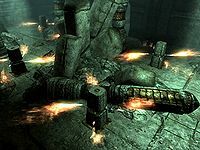 There is are bone chimes on either side of the exit, but they are of no consequence unless you are trying to just sneak past the previous two Falmer. Beyond that, spread around the next corner are three pressure plates, which activate three different flame spouts. One points east, one south, and the last one points northwest. There are two skeletons in the room to the left by the fallen gate. 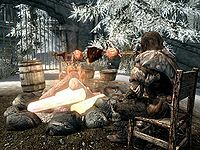 Around the corner by the brazier is a heavily guarded Falmer camp. It is almost impossible to sneak through here with followers as they will not take the shortcut which requires dropping down off a rock; instead they will attempt to go through the camp to reach the same area. There is a hay pile in each tent, and an unlocked Falmer chest in the first tent on the left, and the third on the right. There is charred skeever over the fire and some bone chimes hanging from the roof. The bone chimes are merely for decoration as some of them cannot be reached to set them off. Behind the right-hand tents is another farm. There are four white cap, fly amanita, and Namira's rot, three imp stool, one bleeding crown, and one blisterwort fungi. There is another charred skeever over the campfire by the last tent, and a gate to proceed further. To the north is a table with a dead chaurus, four pieces of chaurus chitin, a Falmer helmet, and a blood-soaked Falmer shield. To the east there are four chaurus egg sacs outside an expert-locked gate to the same section as the previous unlocked gate. There is a total of thirty-eight chaurus egg sacs and a chaurus cocoonDG in the pen and just inside the tunnel. There are a further twelve chaurus egg sacs through the tunnel, and two imp stool and two fly amanita fungi at the other end between the pipes. Around the pipes is yet another Falmer camp, however this one is possible to bypass. Stick to the wall on the right, going up and over the soil covered rocks, where you find an apprentice-locked Falmer chest against the right-hand wall, then down to where there are two chaurus or chaurus huntersDG. Stick to the left and quickly move through the glow of the fire when the chaurus have wandered away, and are looking elsewhere. There are three Falmer in this first part of the camp. The first is in the tent to the left, the second stands by a Falmer totem to the southwest, and the third in a line beyond that one. There are two imp stool fungus either side of the entrance to the camp, and a single spider's egg sac in the cobwebbed area. There is one glowing mushroom on the wall beside the second Falmer, and another one on the wall by the ramp down to the second part of the camp. If you stick to the wall by the ramp, and climb the ramps; they can be followed to the end where you will find a "Thieves Cache" shadowmark. The reason for this is two potions on the ground below, a leveled healing potion, and a leveled strength potion. There is another chaurus cocoon by the potions. The pipes cannot be used to get followers across the camp stealthily as, once again, they will not jump off the end. 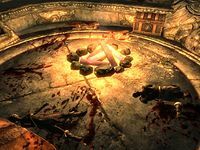 The tent to the left of the descending ramp, behind a campfire, contains an expert-locked Falmer chest. Around the next campfire where the chaurus are, there are six white cap fungus, and eight glowing mushrooms on the walls around the camp. There are 23 chaurus egg sacs at the beginning of the third part of the camp, and four glowing mushrooms on the walls of the tunnel. There are two more Falmer hiding behind the pillar in the middle of the room, so watch out. This time your followers will follow you over the drop. To the right of the gate is a leveled-locked Dwarven chest, and the tunnel leads to the door for the Sanctuary. 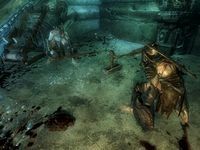 Besides the impressive statue of a Snow Elf there are only two dead Falmer to be found in the sanctuary. There is a set of stairs that loops around the back of the statue, but leads nowhere. The exit is only available once Mercer Frey is dead, and is above the statue's head leading to Bronze Water Cave. Following the Thieves Guild quest Blindsighted the Sanctuary becomes inaccessible from Irkngthand ruins, instead becoming accessible from Bronze Water Cave. Followers may not enter the interior of Irkngthand, even after you have completed the related quests. They will wait outside the doors to the Arcanex. One corundum ore vein is located outside the entrance to the ruins, outside the stone wall near the rock face, 20-25 steps directly west. The Dwarven centurion may already be destroyed when entering the chamber. ? Irkngthand Slave Pens has a one way drop that will prevent players from being able to leave if they have already completed the Thieves Guild quest Blindsighted. The tcl console command can be used. It is possible to reach the top of the cliff again, but you need to have the Whirlwind Sprint dragon shout. Facing away from the door to the Sanctuary, climb the Falmer tent to your left, jumping repeatedly and working your way up to the top. Once you are at the top, aim at the part of the cliff nearest you (there is a small recess in the cliff edge); get as close as possible to the cliff edge without falling in height, and use the Whirlwind Sprint Shout. If you do it correctly, you will land on the edge of the cliff. This page was last modified on 16 November 2018, at 07:49.